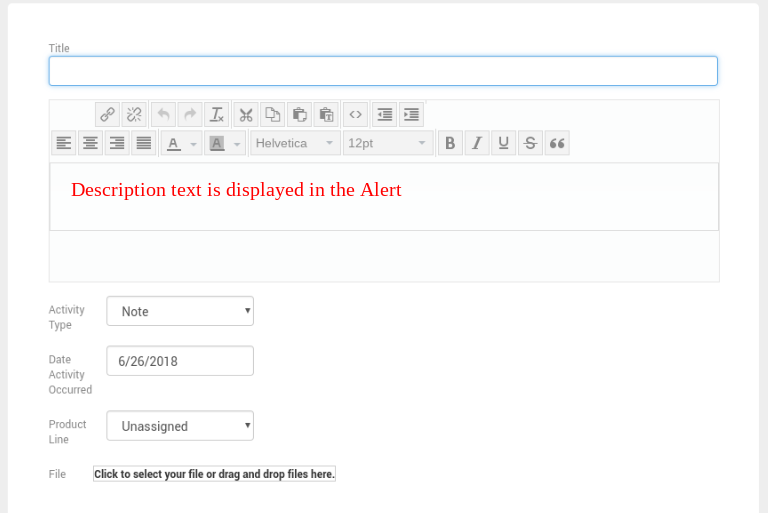 Customer Alerts allow you to change Activities for Customers and Contacts into an Alert that will pop up on the users screen when viewing a Ticket they are associated with. The pop up will also occur when the user views the Customer or Contact from the Customers section. To add an Alert, go to the Activity tab for a Company or Contact. When adding the Activity, check the box labeled “Set As Alert” as seen below. The “Description” field will be displayed in the alert box. When the message pops up, there are three options. Close will close the Alert box, but the next time you view a Ticket with the Company/Contact, it will appear again. Snooze will close the alert for 8 hours, after that time, the Alert will appear again on the Ticket. Dismiss will stop the Alert from reappearing. *In the event that the Activity is modified at a later time, it will reset the Snooze and Dismiss functions. 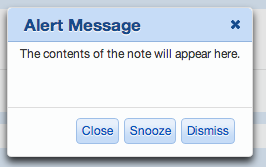 All users will again see the modified Activity and may choose the Snooze or Dismiss option again. You have the ability to set multiple Activites as “Alerts”. In the case of multiple Alerts, they will each display in separate pop ups in the order in which they were created (oldest first).